It is completely understandable the excitement seen and felt by Grenadians from the private and public sectors, who gathered at Maurice Bishop International Airport (MBIA) recently to welcome the arrival of two carriers that are now servicing the US/Grenada route. Delta Air Lines has been transporting passengers to Grenada for some years. But, what they have now done, is started a summer schedule that originates in Atlanta, Georgia, and brings passengers to Grenada. The other airline, JetBlue, has made Grenada its latest global destination. The low-fare airline is now offering twice weekly service from J F Kennedy Airport in New York to Maurice Bishop International in St George’s. A Grenadian, who once lived in the United States, told Caribupdate Weekly that she was delighted that JetBlue is now a travel option to Grenada. She explained that during her student years in America, airlines such as JetBlue, Spirit and Air Trans were there for her to visit, work and study in various states in the US, as well as in several countries around the world. “We expect to see serious increases in our visitor arrivals coming out of New York City. Our Diaspora in New York is very, very excited about this,’’ said Shadel Nyack Compton, deputy director of the Grenada Tourism Authority, at a welcoming ceremony at MBIA for JetBlue. And, tourism minister Yolande Bain–Horsford thanked JetBlue and said she appreciated that the airline has shown confidence in the Grenada route. Revenue from tourism continues to be critical to Grenada, at a time when the country is trying to meet current expenditure, pay its local and international debts, and create more job opportunities. Therefore, getting more tourists here — especially stayover visitors — is certainly welcomed news for government, hotels and others in the tourism industry. Encouraging JetBlue to add Grenada to its travel destinations has been a fairly long process. It was something often talked about and many Grenadians in the US were lobbying politicians in St George’s to make a pitch to JetBlue. An attempt at opening discussions with JetBlue was made by Glynis Roberts, former MP for St George South, when she served as minister for tourism in the NDC government. 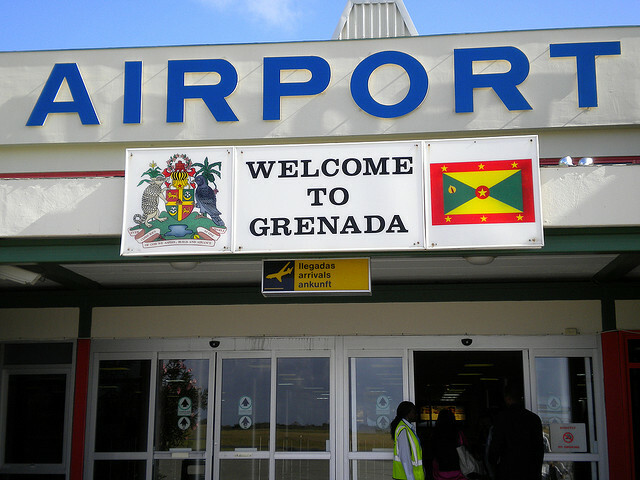 We, as a newspaper, are delighted that the process continued with a change of administration in 2013, and concluded with JetBlue now servicing Grenada. We are pleased at this because it’s the way a country should operate; there should be continuity from government to government. We never may be able to not depend on tourism as major income-earner. However, Caribupdate Weekly would like to see a change in how we — as a nation — treat with these new airlines and inaugural flights coming to Grenada. Our approach was established long before independence in 1974; in fact, to be bluntly honest, it was set by our first inhabitants when they welcomed the first group of Europeans to what was then Camerhogne. They sang and danced and smiled for the visitors. Traditions are hard to break, even when they become obsolete; and, in the case of the airport welcoming ceremony, the template is well in place and those responsible execute it are very comfortable with it. But, it may just be that these ceremonies are more appealing to us than they are to the airline executives and businessmen and women; they travel to all parts of world and may be slightly bemused at the native song and dance that accompany their arrival in Grenada and other Caribbean countries. The disconnect between local perception, and that of the visiting airline officials, of the importance of welcoming package of costumed dancers and other elements, was brought home a few years ago when Canada-based Sunwing Airlines made its first flight to Grenada. A real or perceived slight of Sunwing officials at the airport welcoming ceremony was widely reported in the Grenada media. The Sunwing reps, on the hand, expressed puzzlement and wondered what the fuss was all about. We won’t be surprised in the least if most — if not all — the airline and business people would rather just get their operations up and running, and will see no harm in not having all this native welcoming ceremony at the airport. We are not advocating no welcoming at all; welcoming as an expression of thanks to the airlines for choosing to do business with Grenada; a relationship that everyone hopes will redound to the benefit of all parties, including hotel workers and taxi drivers. But our preference, in 2015 and beyond, is for a classy, private business-type welcoming reception, where all thank you and mutual backslapping are done. Reserve the airport ceremony for the benefit of the media, for a press briefing and an opportunity to capture photos and video clips.